Welcome to the Doomsday primer! This is a project which has long been in the making. We all hope that this helps players new to EDH who are looking to play Doomsday and will serve as a starting point for becoming familiar with the archetype. So for almost anyone getting into competitive EDH (often referred to as cEDH), they quickly run into this card. Doomsday. Or, how to end the game in 1 card. There is a lot of discussion relating to Doomsday but unfortunately no up-to-date introduction on how to play this card in a cEDH setting. This article will serve as an introduction to new players for creating the 5 card library, most often called piling. We're going to start with defining, conceptually, what makes a pile work in cEDH and what the win condition is for those piles. Then we'll build some Doomsday piles together and talk about many of the commonly used piles in a cEDH setting. Finally, we'll conclude by talking about some unique cases. After going through these practice piles and examples, our hope is that you can leave feeling confident to start piling on your own! Our goal for this article is for players to get an idea for what makes Doomsday work in the cEDH setting. Once we've gone through conceptualizing it, we'll discuss the common win conditions, and then build some piles ourselves and talk about occasional unique cases so that you can walk away from this article feeling ready to start piling on your own! There is no substitute for playing a Doomsday (DD) deck and getting your hands dirty. You just have to get out there and do it. All DD players make mistakes, and even long-time players will sometimes make an error. Doomsday is a very difficult card to play, but keep at it; as you play more, it really will get easier. This article is going to cover Laboratory Maniac piles. There are other DD piles which are viable in cEDH. Namely, Grenzo DD piles, and sometimes Gitrog DD piles. We are not going to go into those piles, or any type of "combo" piling. However, it is important to familiarize yourself with these piles, too! Lists look good with at least 3 things in them! Actually, there is an important third point: cEDH piling is unique and what we build here is very different from Legacy or Vintage. Some of the core ideas for piling with Maniac will stand, but piling a storm combo in cEDH is not common. Okay, so we've got all that out of the way. Let's talk about Doomsday. Doomsday itself is a straightforward card. We go find 5 cards from our deck and graveyard, and, combined with our hand, we attempt to win. The difficult part is making the 5 cards work. But, thankfully, the win condition is deterministic and here lies the power of Doomsday. The most common win condition in cEDH DD piles is Laboratory Maniac. The synergy with Doomsday stands out with this little guy. Laboratory Maniac's potent replacement effect gives us a chance to bring a victory within close reach by not only reducing the library to 5 cards, but 5 cards that we have ordered! Now that we have the game plan in mind with DD, let's pile. So, we've been through what we are trying to do with DD and Maniac. Drop the library to 5 and deck ourselves. The underlying principle in building a DD pile is counting to 6. We're going to keep this in mind from here on out, and we'll refer back to it to really make this core concept solid. How do we plan to count to 6? You have to take a look at each card and read how many cards it tells you to draw. In this count, we will include the spell which opens the pile (often referred to as cracking the pile) as well as the numerical draw value printed on each card we include in our new library. So, for example, Gush tells you to draw 2 cards, so its count would be 2 as we are counting to 6. Some combination of cards in hand and in the pile are going to equal 6 when we add them all up. At this point, we're going to take a short detour. Some important things might be popping in your head now! So let's talk about that right now. Q1: Can I go over 6? A1: You can, but be wary not to draw through your win. Maniac has to be on the field. Q2: Can I go under 6? A2: No. Unless you are on a Necropotence or a Mind's Desire pile. These are fringe cases, we'll touch on them. But right now we're going to put them on hold and refer back. Remember that you have to deck yourself and draw with Maniac on the field, so drawing 5 is not sufficient. Q3: How much mana do I need? A3: It's variable. We'll go through examples where you need "no" mana, a small investment, and what to do when you have a lot of resources. Q4: Maniac does not do anything. What do I do about building a pile? A4: This is a super important concept. To be able to draw through the Maniac, at least one card must be a net positive card advantage. As in, it has to replace itself and draw you another card. We'll touch on the important ones. Q5: What does net positive card advantage mean, and why is it important? A5: Net positive card advantage means that after the draw spell resolves you have more cards in your hand than you started with. For example, if the only card in your hand is Nights Whisper, you have 1 card in hand. After it has resolved, you would then have 2 cards in hand. A card like Gitaxian Probe would not be net positive. When you resolve it, it essentially replaces itself (this is often called a cantrip). Drawing multiple cards with one spell is important with Doomsday because you need to run through your pile. A pile of 4 Gitaxian Probes and Laboratory Maniac cant win, but a pile of Gush, Laboratory Maniac and 3 Gitaxian Probes wins the game. Keep in mind that well be using the term net positive card advantage spell in a not-so literal sense, in Doomsday gaining access to two cards is the important part, so spells like Frantic Search, Careful Study and Faithless Looting do kind of count as +1 card advantage spells even though you end up with less cards in hand than you started with. The importance of this concept lies more with how many cards you see from your pile after resolving 1 spell. Q6: What about protection piles? A6: We'll build these after we have a really solid foundation. But in short, each replacement in the pile for protection requires another net positive card draw effect. Remember that since our goal is to draw 6, any amount of cards which do so provide sufficient power to run through the pile. A7: It varies from pile to pile, but generally yes, order is important, especially when we introduce Yawgmoth's Will into piling. You also don't want to deck yourself early without playing Maniac. These questions will be delved into more as we progress, so for now, let's talk about some common tools. Thankfully, when building a pile in cEDH, there are a large amount of tried and true cards which are commonly played, but also relevant to building a pile, in cEDH. It is using these tools that we can pile using strong cards and avoid the use of cards which only have relevance in a DD pile. Cards like Street Wraith and Unearth will not be spoken on at great length since they have overall poor relevance outside of a DD pile when playing the game. From here on out, after each card you will see a (X), which refers to the cards count when we sum things together to 6. Its a shorthand well use to make sure were following the rule we set up. Brainstorm is an interesting card because it reads draw 3 cards. When used as a pile opener it works like Ponder and Preordain, but it's important to keep in mind that Brainstorm does win the game if you have Laboratory Maniac in play and 2 or 1 card(s) left in your library. Laboratory Maniac replaces the last draw(s) with you win the game, which can be used in some lazy piles but is also relevant in some more niche ones. 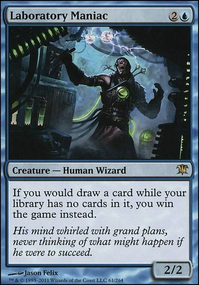 It's also important to keep in mind that because Sleight of Hand and Impulse don't actually contain the words draw a card you can't use them as your last draw spell with Laboratory Maniac. This is rarely a problem though because usually a Doomsday pile contains other draw spells that can be used instead as the last draw. The cards let you see more of the pile, but you have to discard. This will involve having blanks in your hand or pitching Maniac. We'll talk about it later. This card does not contribute to counting to 6 when building the pile (more on this later), but it can open the pile or be used in the pile. Okay, so now we have the tools. Let's build a pile together! We're not going to worry about cost for now since we're learning. We'll bring in cost in this primer, but just not for this first practice example. We have 4 open spaces. We need to count to 6. We'll include our opener as the simplest case: Preordain. We have to hit five now. Let's pick some simple examples. Note the total is 6. If we only had a draw count total of 5, note that we would draw Maniac and be stuck. There we go! We did it! We built a pile and won the game. We've actually learned a lot this far into our DD exploration, and have the crux of piling built into our heads. Sadly, it's never quite this easy. Games are always different. We have different resources. People are trying to stop us. Sometimes things get exiled. We don't have our islands to Gush all we want. So here we get to the important parts of playing Doomsday: how to create an efficiency pile and how to create a protection pile. So we'll start on the cheap. For most seasoned players of DD decks, this is what we have swirling around in our heads first when we are trying to win. How can I do this as cheaply as possible? Can I win really quickly? This probably looks weird. That's completely okay, it is weird. We haven't talked about modifiers, and what Yawgmoths does is a little strange. But we're going to break it down so we can all see why this works, see that the total draw count is still >6 (as we touched on earlier), and then well play the pile. So, how is this 8? We have Gush as 2, then Probe at 1, and the opener at 1 for a total of 4.This is a recipe for disaster and a sad DD player. But, there's an important modifier in this pile.Yawgmoths lets us play from the yard, which means we can play our draw twice, once from early draw, and once from the yard. Our opener gives us 1, which can also be replayed. 4 total draw, which can be played up to 2 times, or 4 x 2. You'll note when we play through the pile, we only need 6, which means we only have to Gush once, but Gushing twice lets the pile be "free". Note that Yawgmoths only doubles cards played before it. If you play a draw spell after Yawgmoths, you do not get to multiply the count by 2. Since the pile easily hits the draw count of 6 in 4 cards, we use LED to pay for Yawgmoths. This is a common strategy, having the Yawgmoths pile pay for its own casting using LED. I. Opener to win (6/7), you can respond to removal by casting Gush! You can do the latter part of the cost with 3 islands in play and no land drop. Simply replay one island. Also note that if you dont have access to 4 islands you can also replay your pile opener from your graveyard as your last draw. This makes our pile cost one mana more. In addition to this, if you do have the extra mana and access to double Gush you should lead with your pile opener, and then Gush in response if one of your opponents tries playing a removal spell. For this pile, the extra is used to spare one from LED to use for replaying the opener. We now just went through the most important pile in cEDH (or at least what I think to be the most important)! Here's a variation for when Gush isn't online or it's gone. Note that this pile generates extra mana, and you can use one LED crack to pay for protection from the yard after pitch to LED as the Frantic Search will provide mana for Yawgmoth's. The pile itself plays out the same as the previous pile. This however, is not a protection pile and the protection it offers from the yard is very narrow. How else can I build this pile? Gush and Frantic Search are gone. This is also a viable pile. Note how we only have 1 net card draw spell for 2 (0) cards in many of these piles. This is because the pile sticks to the idea of drawing 6 and importantly, drawing through each of the dead cards as needed by replaying the net positive card draw effects twice. Yawgmoth's lets us double our card draw count, and this pile hits 8 total, which is well over 6. This touches on something that you might be thinking. Net positive (NP) card draw is important for piling. One card has to be Maniac. If not, then each card could be a replacement draw of (1). However, Maniac is a required (0), thus at least 1 card must be a NP draw spell. Order is important. You want to sequence your pile to use your NP draw spells to push through anything that gives (0) towards the total. These simple concepts quickly become more complex, and it gets more and more difficult to apply them as you build more complex piles. However, by going through these piles, we can see that the core concepts are indeed in place and that we are following the "rules" we set in place earlier. One important concept we may have glossed over is using LED to pay for Maniac. LED lends itself to piling without requiring Yawgmoth's to be in the pile. Namely you can use LED to pay for Maniac on top of a NP or draw 2, and then use the mana to pay for Maniac, relieving the need to have that mana available. This is a pile which dodges grave hate since it does not need the yard, but still uses LED to pay for Maniac. We'll go into this pile later in the protection section. This is fairly efficient, which was the reason this pile saw play. However, when compared to the Gush pile, the Predict pile has a higher mana investment (remember, even without replaying Gush you only need the extra). Because of this, Predict is mostly not worth it in Doomsday decks, since the Gush pile employs stronger cards to make a cheaper pile. Now that we've touched on what it looks like to pile while keeping the mana-cost as low as possible, let's talk a bit about what its like to pile with protection included. It's important to note that piling with protection will make your pile less efficient. Since we want some form of countermagic in the pile, we lose out on another slot in the 5 card stack which could go to draw. So in the end, we have to make up for it using the same principles we put in place earlier. The most important and most commonly piled protection spell is Pact because the cost associated with casting is free for that turn. Force is second, and afterwards up to the pilot. Since we want to be able to create our own piles, let's do another practice pile without worrying about the cost. We'll pretend we had this awesome High Tide turn and can pay for everything. Note how the total count of the pile is still 6, meaning we can draw through our pile and have Pact up at all times after the Gush. Thankfully, our core piling principles remain in place for this type of pile construction, however note that now we need two sources of card advantage or NP draw spells to be able to draw through not only Maniac but also our protection spell. Basically, protection piles always include having a lot of mana or additional cards in hand. Typical Doomsday piles are tight on spaces. Laboratory Maniac, enough draws to reach 6, and something that generates mana almost always take up the full 5 slots. Mana generation is the only thing that can be cut from Doomsday piles and still have them work. So, how do we make such a pile efficient? Unfortunately, it's not simple. LED in protection piles is dangerous since at some point you must discard your hand, leaving you vulnerable at least one time in the piling process. You can pile with LED and protection, but they are at odds with one another. For this reason, Yawgmoth's is also not as common in protection piles. Again, it can be done, but we lose out on the efficiency we want. With the Frantic Search turning on our Lab Maniac to be played from the untap effect. Overall, protection piles require an added investment which makes efficiency piling difficult. Frantic Search is a common choice in these piles as it untaps lands, allowing for payment for Maniac using the same mana used for Frantic Search. However it is important to remember the anti-synergy Frantic Search and Gush have. Returning Islands to your hand reduces the amount of lands you get to untap, so if you're piling with both with less than 5 lands in play do remember to double check everything. Frantic Search and Gush have a small positive synergy too though, having the ability to discard the Islands you bounced with Gush reduces the amount of needed discardable cards in your hand from 2 (or 1, depending on the pile) to 0. Protection in Doomsday is more complex than at first glance since there are so many moving parts when using DD to win. Sometimes the best course of action is not playing out Doomsday unless you yourself have protection in hand, as we saw that working in protection can jar the smooth transitions afforded by our efficiency piles. Doomsday can still be countered (as well as the opener), so piling protection is a course of action taken to protect the pile after the pile has been opened, but not if you cannot protect your DD resolution in the first place. The Pact in your pile won't stop someone from countering your opener. Let's add here a discussion on a pile that avoids graveyard hate yet still employs LED to pay for Maniac. As with the piles we've built previously, this one hits our sum total of 6. We can draw through as normal, but use LED on top of Night's Whisper to add to pay for our Maniac, allowing for Maniac to be played out without having to have the cost on board. Here we're going to talk about a unique but common case seen in piling where the opening card for the pile is Sensei's Divining Top. This card is unique in that it is a card classified as a (0) effect while still drawing a card. Top does not actually progress the Doomsday pile since when you tap Top, you swap it for the card on top of the pile. Top also,however, can be used as your last draw, which can be relevant in rarer piles when there's lots of colorless mana available. Top piling is worth reviewing since when we explore it we'll notice there are many more steps to it resolving compared to the piles that we went over previously. We're going to run through the Gush efficiency pile in depth step by step and flesh out why it works. We are not going to really get into piling with Top in the 5. While certainly very interesting, the piles become very complex and also a bit more costly than desired. It's for the latter reason that Top is not often piled in cEDH unless you have a Helm of Awakening on the field (or you are playing a storm DD combo in Legacy). Something very important to note: we still hit 6 for the count. Which is overall only a small increase in cost from our previous efficiency piles. When piling with Top, the important factors are to incorporate any extra costs from using Top in addition to the fact that when we are constructing the pile, it does not add to our numerical value that we are trying to increase past 6. Other than the extra sequencing, piling with Top is similar to our past piles. Like mentioned, despite Top not progressing your pile it can be used as your last draw. Here's a good example of this, the Top-LED pile (2 islands available, have played land drop). If you had floating instead of , instead crack LED for and play Mana Crypt in your pile instead of Dark Ritual. As you can see in this pile Top can be thought of as a card draw. Do note that the black mana Dark Ritual generates isn't required, Dark Ritual can be replaced with Mana Crypt if you want to be fancy, or with Lotus Petal if you have two non-blue non-black mana floating. The trick this pile uses is the same the Top into Whisper pile uses. Top is an useful card because the draw effect it gives can be saved from LEDs discard, and so we can use a draw 1 effect (like Gitaxian Probe in both piles) to draw into just Laboratory Maniac, and from there we can just tap the saved Top and win. Using Frantic Search instead of Night's Whisper obviously requires you to have two cards you can discard to Frantic. When you can open a pile with a draw 2, you essentially start the pile with an increased count when summing the collective draw spells. So, in practical terms, we begin the pile with a (2) instead of a (1). If you pile some of the previous stacks, this lets you pile in either mana (rock, ritual, land, etc.) as a (0) or you can use this to include a protection spell in the stead of what would be a draw spell. You can modify the pile to include resources you would not otherwise have been able to use. We can see how this pile would play with with added benefit of including either extra resources or countermagic. Additionally, many previous piles are opened effectively with a draw two, often alleviating the need to cast Probe or the opener twice. As you can see it's not required to draw into Labman. Getting it into your graveyard is enough. The old Predict pile abused this, and this can still be abused with a Looting spell. For example, you might come across a scenario where you have Doomsday and Frantic Search (or some other loot 2) available and the mana to cast both but only one blank card in your hand. However if you look at what we just did in the pile above what we can do with a looting spell is draw Gush and Labman and then discard the Labman (in addition to the blank card). Note that apart from Doomsday and the pile opener this pile doesn't require any mana, so with an effect like Dack Fayden's +1 (target player draws two cards, then discards two cards) we can just cast Doomsday, do the pile above, and +1 Dack to win. Granted this is an uncommon scenario as most Doomsday decks don't have access to or don't play Dack, but the idea is there and the pile is useful in other scenarios as well. The take-home from these examples is that when you are forced to loot your pile, you can draw into Maniac early and pitch it. Note that in the following piles we expect to have only 2 islands in play and that we've used our land drop. This pile is an interesting case of Brainstorm's reach of 3 cards being a downside instead of an upside, however with a little different order we were able to work around it. Brainstorm's ability to put different cards down is useful in this pile in another way too, because if we happen to have a combo piece (either Laboratory Maniac or Yawgmoths Will) in our hand we can use Brainstorm and use that to put the piece in the correct place. As you can see in this pile we actually use Brainstorm's ability to put cards from our hand into the pile and the ability to shortcut and only have 4 relevant cards in our pile.The same pile as above can be used if instead of Yawgmoth's Will we have Laboratory Maniac stuck in our hand. In a vacuum there really isn't a relevant difference to these piles, the only difference is the order where you cast your free draw spells from your hand. However, you can't use Brainstorm as your cantrip in Pile 2 because that would cause you to overdraw, and pile 1 can be used with Yawgmoth's Will stuck in your hand since you can do the same trick mentioned in Cantrip-Probe lines, use Brainstorm as your cantrip drawing LED, blank card (should probably be Pact of Negation) and Laboratory Maniac and put down Laboratory Maniac and Yawgmoth's Will. And of course this pile works with the third permutation of having a cantrip and Gush in hand! The pile identical to Probe-Gush pile 1 except Gitaxian Probe and cantrip switched places, so a rundown would be unnecessary. Of course if your cantrip happens to be Brainstorm, you can do the Yawgmoth's Will trick mentioned above in this version too. Okay you goofs. You probably want to know how to do this. Let's go over it. It's pretty rare since you need to see so much in your opener, but hey you gotta have faith. Requirements - Doomsday, Gitaxian Probe, LED in hand, in pool to cast Doomsday. At first this pile doesn't really look like anything we've used before, but if you think about it it makes sense. We have two of our basic Doomsday cards in hand so we can devote the two extra slots to generating mana and fixing mana. We're casting and recasting Night's Whisper so this pile costs 4 extra mana compared to just casting and recasting Gush with 4 islands, but thankfully Dark Ritual is a +2 ritual (costs 1 mana, generates 3 mana. -1+3=2) which allows us to generate the needed 4 mana (-1+3-1+3=4). If we compare this pile to the 2 island Gush pile youll see that we're using Gitaxian Probe instead of Ponder and Night's Whisper instead of Gush. In the 2 island Gush pile Yawgmoth's Will turns Gitaxian Probe from a cantrip into a card advantage spell which is used to access the last two cards (Yawgmoth's and Labman), but because No Gush, Probe-LED pile is able to recast Night's Whisper (unlike 2 island Gush pile, which isnt able to recast Gush) just like the 4 island Gush pile and can access the last 4 cards of the pile in chunks of 2. Because this doesn't require recasting Probe to keep the pile going or Probe-LED'ing to cast Yawgmoth's Will, the last card slot can be used to fix mana. This pile is great at showing non-obvious lines that after figuring them out still kind of follow the basic ideas of pile building. Oh, and since we're here, the requirements for a turn 1 win are having a black source, Dark Ritual, Doomsday, LED and Probe in your hand. This allows you to hit that for Doomsday and having access to LED and Probe. In this part of our Doomsday exploration, we're going to talk about some piles which are definitely worth knowing but don't actually follow the rules which we set in place earlier. That's because these piles do not require certain conditions to be met within the pile but rather dependent on a core card choice which more or less completes the pile itself. These are some piles that we are going to discuss which vary in application depending on the archetype being played. Mind's Desire Piles - Wicked Fun. This pile relies on having the resources to successfully cast a Mind's Desire off the first draw. While this pile is certainly very resource intensive, it is very difficult to interact with after opening and offers a unique angle of play for resolving the pile. You need a storm count of 4 to exile the library, so beginning with the storm count at 2, the draw raises it to 3, and casting Mind's Desire raises it to 4 and exiles the entire library. From there, you play Maniac from exile and draw to win, using protection from exile as needed. Before moving on let's flesh out the most optimal Minds Desire pile based on the cEDH metagame. There are important reasons for each of these choices in the spots given. Concerning Force, since there are no cost constraints on the pile, Force dodges Mental Misstep and Spell Snare. The reasoning is similar for Pact of Negation. The initial draw spell being Wheel of Fortune dodges any countermagic which specifically targets blue spells, though other wheels are viable. Gush/Pact is dependent on the game, with Gush allowing for instant speed draw in response to Abrupt Decay, while Pact is useful as a second layer of protection. Requirements: in mana pool, Doomsday and Gush in hand, 2 Islands in play. Interestingly enough the fat 6 CMC sorcery actually helped us when building this pile. The scenario is rather far-fetched as having two islands in play but isn't that likely to happen. Still, this was an interesting case of using Mind's Desire in a non-cheese pile. Necropotence Piles - I hate counting. This is straightforward and only applicable easily when you have a Necropotence in play. The general idea is that you can open and draw through a pile but use Necropotence to shave cards off the library until you can play Maniac to win. Another unique use for Necropotence is to exile Sensei's Divining Top from your library if you need to use it somewhere in your pile. Generally however, you probably won't be looking to actively pile Necropotence, and it will play a role in winning if you have one in play or happen to have one in hand. Otherwise, it's likely not going to find a spot in your 5. Wheel Piles - The only way to play is complete overkill. This is another pile which cuts corners to play fewer cards before winning. A wheel in hand also leads to a succinct win with a Maniac in play. This pile is not common, and mostly a way to seal a game when many resources are at hand or you are missing some key parts for other piles. Brainstorm can also be used instead of a wheel. Because of Laboratory Maniac setting a replacement effect, Brainstorm with 2 cards left in your library reads Draw 2 cards, then win the game, then put two cards from your hand on top of your library. Of these piles so far, the important one to really bear in mind when going through lines is the Mind's Desire pile for its high degree of resiliency. The major pro to such a mana investment-heavy line is how difficult it is to interact with. The other piles are just to open up the playing field to using unique cards to run through a pile which do not easily follow our conceptual guide. Why this pile exactly? If we position ourselves at our opponents' shoes, this pile doesn't give us any window to counter one spell. They cast Gitaxian Probe revealing Pact of Negation, so if we try and counter Gitaxian Probe they'll just Pact of Negation our counter. So Probe resolves drawing Pact, and now they have Pact protection for the rest of the pile. Because of the 5 card constraint we can't fit Lotus Petal in this pile, so this pile does require us to have available. The pile is doable with different mana requirements too, for example if we don't have blue available we can replace Mana Crypt with Lotus Petal in which case the pile requires instead of , and if we don't have 2 islands in play for Gush we can replace Gush with Sensei's Divining Top instead in which case the pile requires us to have available. Future Sight piles are simple enough that figuring them out shouldn't be a challenge, but the pile with built in protection is definitely one worth mentioning. What now happens is that you'll cast Laboratory Maniac, and when it resolves you attempt to cast Gush. Gush is now on the stack which then reveals Pact of Negation on top of your library which you can cast if someone aims their Doom Blade* at your Laboratory Maniac. One other neat pile is the Silence/Future Sight pile, which is unique since it forces out one piece of interaction or the entire table will lose. The pile has no additional requirements other than turning on Gush/having 2 life and having Future Sight in play. It's a neat pile which makes the for Silence natively and uses Lion's Eye Diamond to pay for Laboratory Maniac's . The interesting thing about this pile is that if no opponent has an answer to the Silence, you will play out the pile and win! However, if an opponent counters the Silence, the pile can keep on going right along. It's an interesting structure which forces interaction, something we haven't really seen yet. If you want to be really cute, and you have your land drop still available, making the first slot into a land means the mana for Silence cannot be countered, and you are guaranteed your bait. When we were brainstorming this pile, the land was a Plains, and we affectionately called it the Plains pile. It does have a unique architecture in our list of piles, though sadly, it's very unlikely it will ever show up in a game. Regardless, it's fun to think about. Thanks to trestian for being instrumental in coming up with the Plains Pile. Timetwister Piles - Oh boy. Dude not to complain or anything but you've just sat there mumbling and staring at your hand for 20 minutes. Are you on drugs or should I call an ambulance? Timetwister at first glance looks like a card that doesn't synergize with Doomsday at all. However, the important part of first shuffling your graveyard and hand into your Doomsday pile, then drawing 7 cards makes for some really interesting and complex piles. Twister piles are among the strangest of the bunch and they all depend greatly on weird things like do you have tutors, a chrome mox, any rituals or unneeded cantrips in your hand. Because of this we'll just briefly mention the concept and then let you try and resolve them in your own playgroup. Requirements: in pool, Doomsday, Timetwister and 2 blank cards in hand. 2 Islands in play. If you try and calculate how many cards we'll have in the rest of your deck (Doomsday + 2 blank cards + pile = 8 cards). This means that one of the cards we have will be left as the bottom card of our library after Timetwister has resolved. However, with this pile it doesnt matter what the card left in our library is. If it's an important card (one of the pieces of the pile except for Gitaxian Probe) we can cast Gitaxian Probe and draw the missing piece. If the missing card is Gitaxian Probe, Doomsday or Lion's Eye Diamond we can just play Petal and Crypt, play Labman, then Gush for the win. May the draws ever be in your favor. We're going to try and explain this pile here. Basically you first cast Doomsday doing the pile above, then you cast Brainstorm drawing Lions Eye Diamond, Gitaxian Probe and Laboratory Maniac putting a blank card and Timetwister down. What you can then do is play Lion's Eye Diamond and LED-Probe into Timetwister, then Timetwister. What happens then is that you'll draw 7 cards leaving 3 random cards as your library (LED + Probe + Laboratory Maniac + Yawgmoth's + Lotus Petal + Brainstorm + Doomsday + 3x blank card = 10 cards). From there, if you hit Lotus Petal and Brainstorm you can Brainstorm the rest of the pile into your hand putting a blank card and Yawgmoth's Will on top, then LED-Probe into Yawgmoth's Will, cast Laboratory Maniac using LED, cast Brainstorm using Lotus Petal and then win. However, if you didn't hit both Brainstorm and Lotus Petal you're screwed since you won't be able to do the line above UNLESS you have LED and Gitaxian Probe in hand and Yawgmoth's Will happens to be on top. There are lines with this particular pile that still work even if you don't have Petal and Brainstorm in hand, but this is basically how this particular quantum twister pile works. Timetwister lines are really complex and as of the moment of writing this primer we don't feel like we even understand them nearly as well as we could. Remember how we said the best way to learn is by doing? The time is now to just go out and lose games with Timetwister. This for all you cascading maniacs out there. The specific Yidris pile is actually fairly simple, so we'll run through it quickly to get to the other major commander specific pile. D. Gush resolves to win! Interesting to note here is that if someone tries to interact with Ancestral, casting anything in response will cascade into Pact, allowing for protection. Pretty cool, huh? Here's a Zur specific pile. Really, it's an Esper pile which makes use of Pull from Eternity. Okay let's set the stage! Someone has exiled your Lab Maniac! Maybe it was a Swords? Perhaps it was extracted somehow? What do we do? Okay, so it's face-up exiled. We're gonna pile with Pull from Eternity. These aren't terribly efficient piles, but we can build them to at least have the pile pay for Yawgmoth's and Maniac. There is a lot of draw power in this pile to draw through our dead cards. We can't abuse our free spells as easily this time since we need 3 (0) draw spells in the pile (LED + Yawgmoths + Pull) and we have to cast Pull before Yawgmoth's resolves. Or we'll just be back where we started. This pile was built to have LED pay for Maniac and Yawgmoth's. LED is not a requirement for Pull piles, but since Maniac goes to the yard after, it's a nice card to have to pay for our yard recursion. Which is fairly doable, especially on a storm turn. If you play Pull before the Doomsday cast, you can just build a normal pile. You can use Frantic search instead of Night's Whisper to make the pile cost if you can untap lands to pay for Pull and whatnot. There are a number of ways to incorporate Pull into a pile since it will function much like incorporating a protection spell. Additionally, you can draw through Pull with Brainstorm or use Frantic Search in place of Night's Whisper. Bear in mind, you need a way to draw Night's Whisper. Black has a decent amount of card draw to get this done. Red loot spells might also get you there. This pile gets significantly more efficient if you have blue since you can place Predict in slot 1 and then predict for Grapeshot instead of jumping through hoops with multiple draw 2s. The count will make more sense as we go through the pile. Really it's because there's no Maniac. Once you lose Labman, the draw count becomes significantly less important. This pile has a number of ways to work. It's best with Predict as mentioned earlier, but we don't have blue. The pile I listed costs in total. You can play around with draw spells to get the pile moving, as a number of different things work. But bear in mind it's an awkward pile, as 4 slots are taken up in Grapeshot, Lion's Eye Diamond, Conjurer's Bauble, and Second Sunrise. If you can only draw one, you might need one of the draw 3/4 spells. Many of red's or black's draw spells hit 2 cards though, so at least the density is there. We just went through the original Second Sunrise pile. There are other variations of it. Decks could swap in Tendrils of Agony to make the pile red-less. This was a way to make DD work, but this is much more of a constraint that a blessing. Making the post-Sunrise loop is non-trivial. There are other things you can do also without blue. Namely, piling a combo and winning with that combo. Worldgorger Dragon piles with Animate Dead and Faithless Looting plus some outlet are fairly common, so feel free to use George with any outlet you prefer. Even silly things Shivan Gorge work with George. Other combos which can be piled are Kiki-Jiki, Mirror Breaker piles and winning with some Twin combo. Another key combo which can be piled is Auriok Salvagers with Lion's Eye Diamond to make infinite mana. You can then use an outlet like Walking Ballista to kill the table, and recur it much like above. * Another combo to think of is Mikaeus, the Unhallowed with some recursive outlet. This gives another reanimator style pile, and you can do this exclusive in black. I haven't spent too much time exploring blueless though, to be honest. So there is likely a lot more space to tap into. Unfortunately though, losing Maniac really hurts, and it begins to make winning off DD more a chore than a convenience. *Special thanks to PGleo86 for taking some time to develop some of the Walking Ballista piles. Cracking LED with a Gitaxian Probe on stack to draw Frantic Search is actually not a good play. Gushing into Frantic Search with less than 5 lands in play is actually not a good play. Casting LED from your graveyard with Yawgmoth's Will, cracking it to play Frantic Search and drawing Laboratory Maniac and Gitaxian probe is actually not a good play. Cantripping into Frantic Search and Frantic Searching into LED and Gush when you only have one card you can pitch to Frantic Search is actually not a good play. Including Chain of Vapor in your Future Sight pile to get rid of Elesh Norn or some other relevant hate piece is actually not a good play. A Doomsday pile is 5 cards, your hand has 5 fingers. Thinking of your fingers as cards in your pile helps visualizing lines. Staring at your hand also makes you look like a tool when playing in paper. When casting Gitaxian Probe when resolving your Doomsday pile it is always correct to target yourself with it. This is because this way your opponent can't act as a kingmaker making your pile not work since scooping makes Probe fizzle, but Probing yourself also has great meme value. When playing in Cockatrice or MODO notepad.exe is a great tool when trying to come up with piles. Trying various piles and keeping track of mana is super easy. Keep in mind that if your pile still doesn't work it'll make the experience twice as humiliating. These may or may not have been developed from experience. Alright! You made it. Can't lie here, that was long. Doomsday is a complex card. We're going to stop our discussion here. The next thing to do is now take what you've learned and dive head first into piling and playing a Doomsday deck. As you play and construct your own piles, you will learn a lot of different ways to approach piling. Hopefully, this discussion on playing Doomsday (focused on Laboratory Maniac) provided some foundational knowledge that you can take into the format with confidence to start being able to think about what is needed for a Doomsday pile to work. You have all the tools you need, and now it's definitely time to get out there and starting piling. I added Grenzo piles. By that I mean I linked a primer which does a much better job than I could.